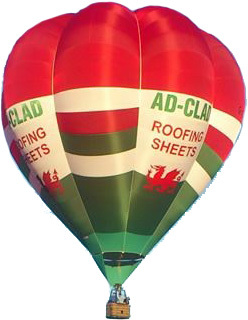 In 1979, a hot air balloon was purchased and sign written to promote the business as well as to enjoy seeing the world from a great height. It is now a common sight in the area ! A few years passed and eventually, a new premises was needed to expand the business. Eirian managed to secure the present day site from the Co-op group. It was a good move and over the years the business has grown & grown. In 2001 his son, Arwel , joined the company. In 2013, a new balloon was acquired and Arwel, following in his father’s footsteps became a qualified Balloon Pilot. Ad-Clad, as it is known has provided work for many locals who make up a strong work force.